Developed in early 1926 as an all-metal version of the Gamecock fighter. Never entered service. This plane is one of the better tier 1's. Its abundance of health paired with great guns make it a deadly combo. It's speed can hamper it some but is overcomable. Sort of a good example for the rest of British fighters. Head ons are a good idea and so are boom and zoom tactics. 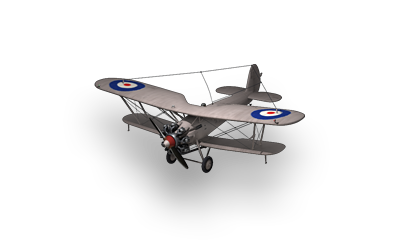 The Goldfinch first flew in May 1927, and in December it went to RAF Martlesham Heath for trials where it proved fast and high with a rapid climb rate, and generally good manoeverability, although spinning behaviour was substandard. 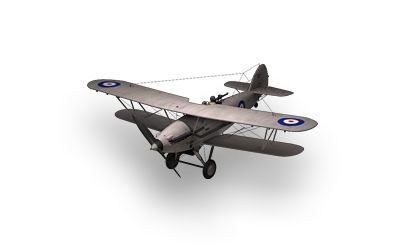 Gloster's submitted it as a contender for Air Ministry specification F.9/26 for an all-metal day-and-night fighter, but it failed to meet the required load and fuel requirements and was eliminated quite early. 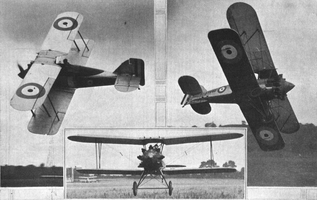 The Bristol Bulldog was the eventual winner, with the Goldfinch being used for trials at Martlesham Heath until October 1928. This page was last modified on 27 November 2018, at 12:01.